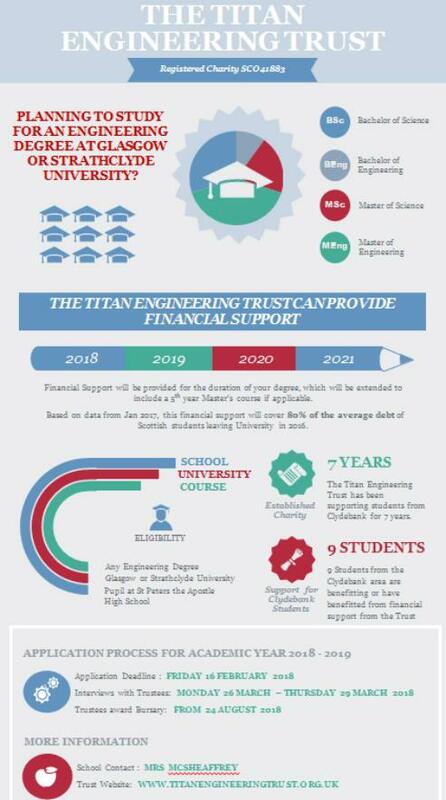 The Trust is a private bursary scheme established in 2010 to provide financial support to students from the two high schools in Clydebank (St Peter the Apostle High School and Clydebank High School) to study engineering at the University of Glasgow or the University of Strathclyde. The Trust is a Scottish Charity, registered with OSCR (the Office of the Scottish Charity Regulator). Provide financial support to students from our school who have been accepted on a full time engineering degree course at the University of Glasgow or the University of Strathclyde. Encourage students to enter into engineering degree courses at Glasgow and Strathclyde Universities. Assist students who may find it difficult to accept a place at university for financial or other reasons. This year we had 4 pupils with SPTA who were shortlisted for this fantastic opportunity offered by Titan Trust. Huge congratulations to Brendan Kelly who was lucky enough to secure the Titan Trust bursary for 2017. Well done Brendan and good luck with your studies.